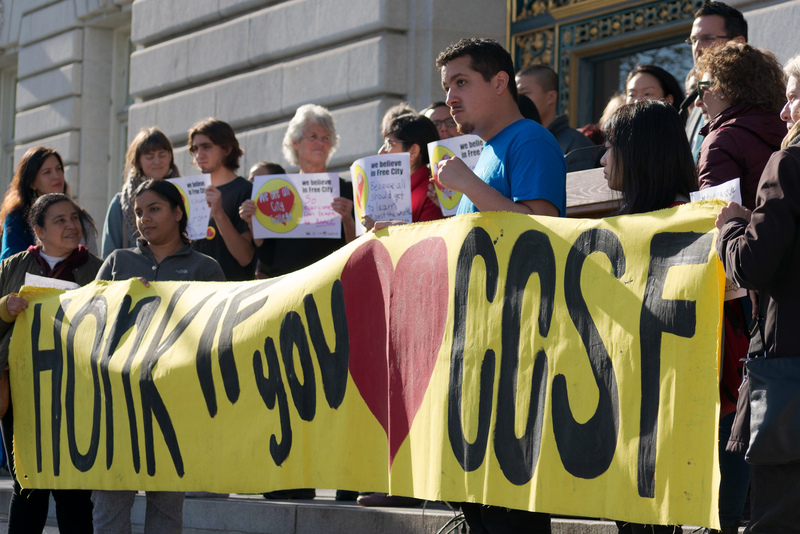 In a step toward making City College’s Free City program more permanent, the San Francisco Board of Supervisors voted 7-1 on Dec 18, 2018, to put a new charter amendment on the November 2019 ballot that would secure new funding for the program. If passed by San Francisco voters, the amendment would create a “set aside” from the city’s general fund for the Free City College Fund, which would receive a baseline of $15 million dollars annually over 10 years, starting 2020. Former District Six Supervisor Jane Kim presided over the meeting, the last of her eight-year term. In 2016, Kim’s office spearheaded Proposition W, which raised the property transfer tax on real estate sales over $5 million and currently funds Free City. “We wanted the (Free City) pilot to begin and get our foot in the door, and the program has been much more wildly successful and popular than I think any of us — even the strongest advocates among us — have anticipated,” Kim said before the vote. In its first year, the tax created by Proposition W raised $27 million. However, City College almost immediately had trouble securing enough money from it to fully pay for the tuition of students it was supposed to cover. Following a deal negotiated between the late Mayor Ed Lee and the college, the city created a Memorandum of Understanding that set aside $11.2 million to cover costs for the pilot program for 2 years. Not only is Free City set to expire in June 2019, but it does not cover the actual cost of the program. City College was forced to ask the city for an additional $4.77 million in June 2018 to cover debt incurred running the Free City program. “When we originally created the Free City program, the Board of Supervisors voted to appropriate almost $10 million dollars to be spent on Free City if Proposition W passed at the ballot. However, the mayor at the time disagreed with the amount, and he had the power to not actually spend the $10 million that was appropriated by the Board of Supervisors and we had to negotiate with his office to secure any dollars at all for the program,” said City College Trustee Ivy Lee, an architect behind Proposition W. “As a set aside, the mayor cannot refuse to spend the money because it would be violating the will of the voters since every set aside must be voted upon by the voters to go into effect,” Lee said. City College’s faculty union American Federation of Teachers, 2121 supports the charter amendment. 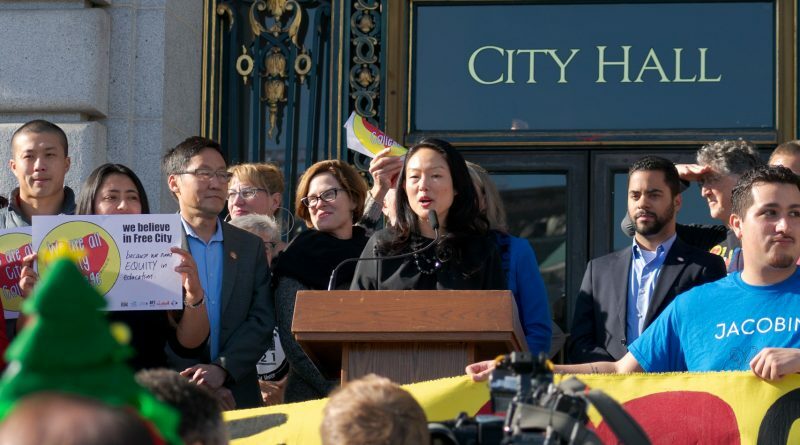 AFT 2121 and the San Francisco Labor Council originally presented the idea for a Free City program to Supervisor Jane Kim. “AFT 2121 really wants to defend diverse, accessible quality education,” said Athena Waid, who works as the Organizing and Communications staff member for AFT 2121. She was originally hired to assist in the campaign to save the college during its accreditation crisis. Over the five years that AFT 2121 fought to keep City College open, they had built enough support to enable them to pivot toward the Free City pilot program, Waid said. 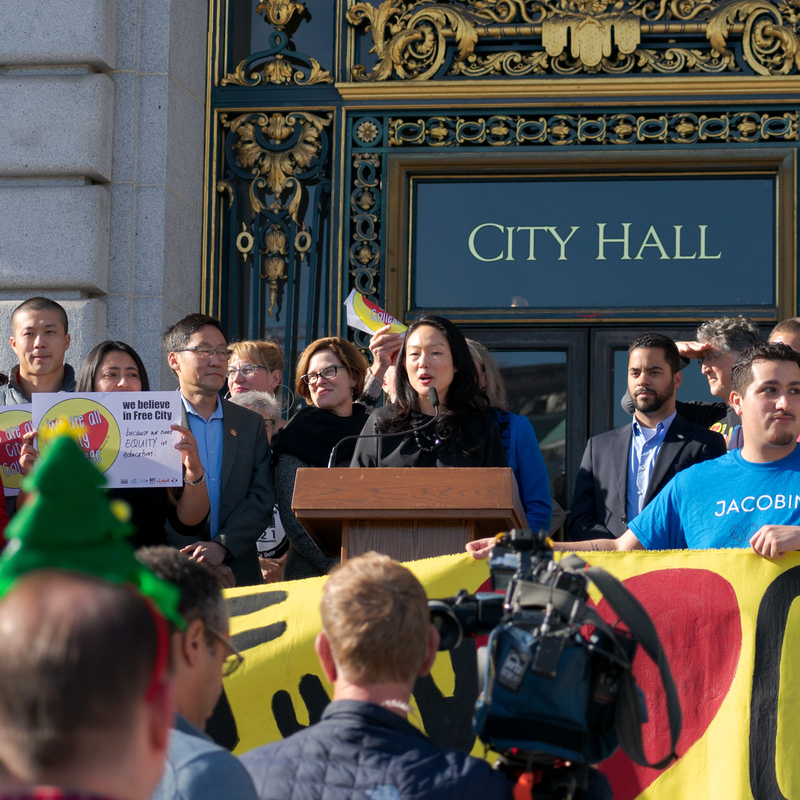 Before the Dec. 18 vote last year, AFT 2121 visited each San Francisco supervisor to sing holiday classics, with lyrics rewritten to support Free City. The caroling was a throwback to the time AFT 2121 caroled in support of the original Free City proposal in 2016. Waid said that even before caroling, AFT 2121 knew they had enough support to put the charter amendment on the ballot. “This would provide stability for the program for a minimum of 10 years and allow students the certainty that Free City will not be eliminated from year to year. With this certainty, students can plan their educational pathways without wondering if they will be able to afford this education from year to year,” Lee said. Students interested in getting involved in campaigning for the Free City Charter Amendment can get intouch with AFT 2121.